Notice: This shop no longer exists. It was replaced by Eldon the Merchant in the Castle, and Spinnet the merchant in Shalemont. The Quigley luxury shop is found in Farcrag Castle directly to the West of the Fargrag Castle Courtyard Leystone. 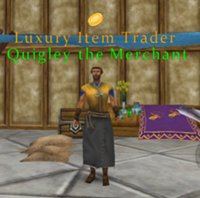 He is Quigley the Merchant (with Luxury Item Trader title above his name) and only available to players who have at least 20,000 gold. 'The Quigley luxury Items do not have a level requirement.